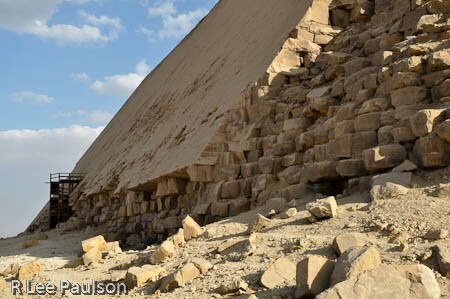 The Bent pyramid gets is name from the fact that part way up the sides the slope angle changes. The standard explanation for this is that part way up, the builders changed their minds. 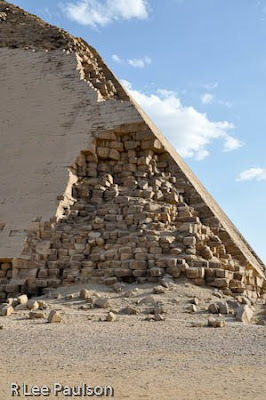 The reason given for the mind change is that the builders were concerned that continuing the pyramid at such a steep slope would make the structure unstable. As usual, the basic assumption behind this conclusion is that the builders were unsophisticated primitives. In reality, it is an arrogance of our time to believe our current culture represents the pinnacle of both civilization and engineering. There are several problems with the above theory. 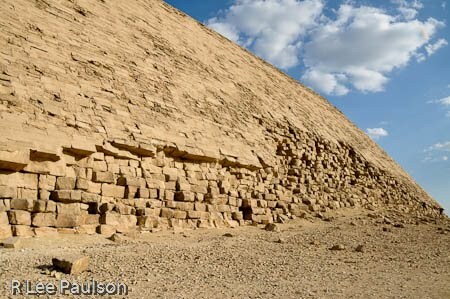 Chief among them is that the Bent Pyramid has two separate entrances, one from the north and one from the west. These two entrances lead to two completely different sets of chambers. 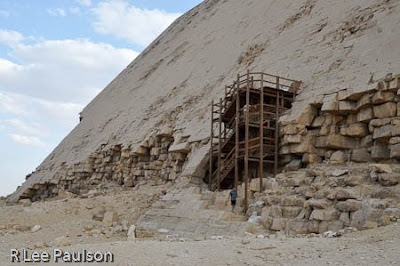 Look carefully at the above photo at the bottom of the pyramid near the left side and you will see a dark shadow which is scaffolding that allows access to one of the entrances. Two entrances, two sets of chambers, conceived and built into the structure from the beginning of construction suggest that the ancients had a master plan and followed it. There is another nice feature of this pyramid. Most of the limestone casing blocks are still intact. That explains why most of the sides above look so flat. Wind and sand weathering have taken their toll, of course, but this is mostly what the great pyramid would still look like had the limestone casing blocks not been quarried off of it. 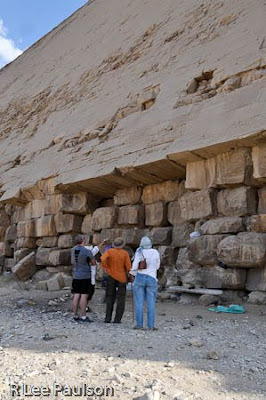 There is a reason the casing blocks were not quarried off this pyramid. Notice in the above photo how they have been placed in such a way that the top blocks hold the cantilevered lower blocks in place. It was an ingenious construction system that made it hard enough for the casing blocks to be removed that those who would have done so gave up and left them in place. This is yet another reason why I simply cannot bring myself to believe the ancient builders did not know what they were doing. Here is view of a corner, where one can see that someone made a concerted effort to get the casing blocks off by tearing out the corner of the structure. Look closely and one can see how difficult it would be to begin at the bottom and remove the casing blocks by working one's way up. Another close up of the edge where the quarriers gave up. It also shows more of the entrance scaffolding. Melony took this close up of the corner. One can clearly see how someone beat the devil out of the casing blocks in an unsuccessful attempt to dislodge them. A shot of another side where they had managed to remove more of the casing blocks. It also shows the steep angle change.The top half is not visible from this angle. 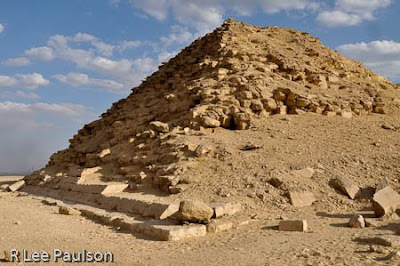 At some later period in time, West says during the middle kingdom, which would be roughly a thousand years after the Bent and Red pyramids were build, other smaller pyramid were built which are clearly tombs. 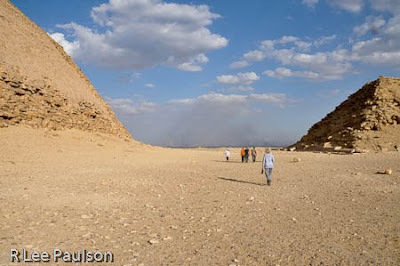 This shot shows the proximity of one of those later pyramids to the Bent pyramid. Also in the above photo, check out the black haze cloud that looms directly above the members of our group who are walking around the Bent pyramid. 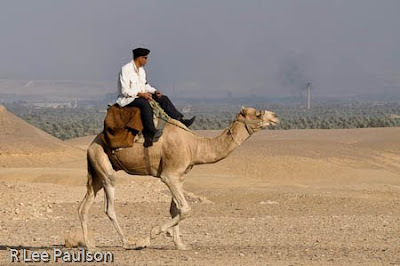 That is the industrial complex of Cairo to the east, spewing black pollution in the air. That is where a good share of Egypt's steel smelters and other heavy industry is located. The later structures were made mostly out of mud brick cased with limestone blocks. No one is quite sure why the inferior method of construction was chosen when other alternatives were clearly available to the builders. Here one can see the remnants of the limestone casing blocks, much smaller than on its bigger cousin next door and how the mud bricks have mostly deteriorated into dirt. Archaeologists have found more boats and lots of fine jewelry in these tombs. However, no trace of a sarcophagus has been found in either the Bend or Red pyramids. Here is a closer view of the black air and smoke stacks in the distance--and an ever present Tourist policeman patrolling the perimeter of the site. 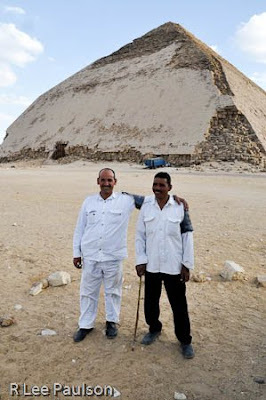 It appears that they are planning in the near future to open the Bent pyramid for tourists to enter. The dusty dirt road to this pyramid is in the process of being paved and this scaffolding is standing ready. Mike, ever the adventurer, climbed up the scaffolding to see if the entrance door was, indeed, open. He had barely reached the top when we heard shouting and screaming. Seems the guards weren't pleased to see him up there. I was about twenty steps behind him when the screaming began. Here he is coming back down. However, after a little baksheesh changed hands, everyone was all smiles. 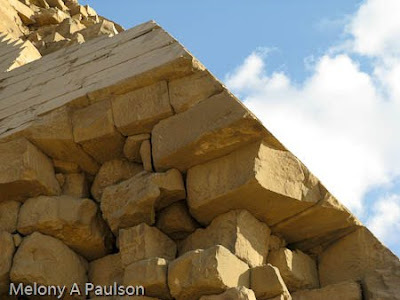 Someone has recently hypothesized that the Bent pyramid was a healing site and that the two distinct side angles, combined with the two distinct sets of chambers allowed the ancients to heal with two separate frequencies. There is no way to prove this, of course, just as there is no way to prove that the ancients changed their mind during construction. 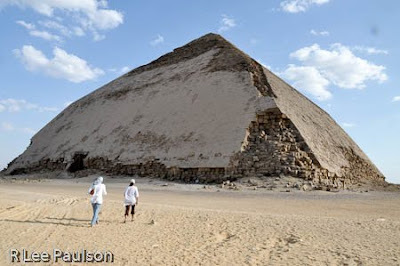 Still, after hearing for myself the wonderful harmonics in the Red pyramid (and later the great pyramid) the theory that these magnificent structures had purposes related to sound and resonance as a major component of their design and use makes much more sense to me. We do know that one set of the interior chambers of the this pyramid has several corbeled rooms, similar to those of the Red pyramid, which I believe bolsters this contention. West made an interesting point about these two pyramids. He says, "If the attribution of the two main pyramids at Dashur to Snefru and the accepted chronology are correct, it means this king in the course of a reign of twenty-four years was responsible for the quarrying, transport, and dressing of some nine million tons of stone, more than three times the quantity of the Great Pyramid. In modern terms this amounts to nearly a million truckloads. Engineers who have tried to work out the logistics of these building efforts invariably agree that even using the most modern equipment and methods, the projects are staggering." Primitive builders who changed their minds half way through construction? I think not.